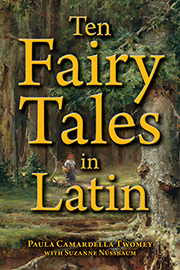 Enchant your students with Ten Fairy Tales in Latin. These popular fairy tales are presented as a script for reading aloud and performing in class or for a larger audience. Each tale concludes with both a traditional ending and a "twisted ending"-an unexpected alternative conclusion to the story. A puzzle or activity accompanies each tale. Optional Grammar Notes and Grammar Exercises for each tale review such grammatical concepts as indirect commands, purpose clauses, and the hortatory subjunctive. The ten tales include Goldilocks and the Three Bears, Little Red Riding Hood, Cinderella, The Little Red Hen, The Gingerbread Man, The Three Billy Goats Gruff, The Three Little Pigs, Snow White and the Seven Dwarfs, The Pied Piper, and Sleeping Beauty. Ten Fairy Tales in Latin by Paula Camardella Twomey with Suzanne Nussbaum presents an opportunity for students to read familiar childhood fairy tales that have been translated into Latin. The book opens with suggestions for its use in a language classroom, either as a reader or as scripts for plays or puppet shows. These ten fairy tales can easily supplement either a high school or a college Latin curriculum, since they provide vocabulary reinforcement in a delightfully refreshing way: via familiar stories written in the target language. The book offers an added advantage for Latin language learners, as it also reinforces grammatical structures. Students in the third course of a four-course sequence of study will find these fairy tales very accessible. They will be able to read them on their own and work with grammatical concepts that often seem problematic co them. Students at earlier levels of study will appreciate hearing the stories and recognizing common vocabulary, while guessing the meaning of less familiar words. The ten fairy tales include "Goldilocks and the Three Bears," "Little Red Riding Hood," "Cinderella," "The Little Red Hen," "The Gingerbread Man," "The Three Billy Goats Gruff," "The Three Little Pigs," "Snow White and the Seven Dwarfs," "The Pied Piper of Hamelin," and "Sleeping Beauty." The names of the fairy tales, moreover, have been cleverly rendered into Latin. Each fairy tale is presented in a similar fashion: the chapter begins with a list of vocabulary that might be unfamiliar to the student, and then the fairy tale is presented as a script or dialogue, which has been carefully translated into Latin that is accessible to students. In the manner of fairy tales, there is some repetition throughout each story; students will find this tremendously helpful and fun. Each fairy tale offers students a choice of two happy endings, either the more traditional ending or a surprise finis tortus. The Latin in the fairy tales emphasizes the structures and vocabulary that will aid students in reading works written by the more canonical Latin authors from antiquity through tl1e Renaissance and beyond. This is definitely a book that will add to the students' understanding and appreciation of the language. Once students have examined the vocabulary and read, performed, or recited the play, they can review the vocabulary with the activity that is presented at the end of that fairy tale's chapter. These activities include crossword puzzles, vocabulary matching exercises, word search puzzles, and word transformation exercises that ask students to translate words, and often require students to supply different inflected forms of the requested words. For classes with an active Latin component, every fairy tale provides opportunities for enrichment, most obviously, reciting or acting out the plays to enforce student understanding, or through teacher-designed dictation and questioning activities in which the teacher can easily adapt some of the vocabulary activities as a springboard. After the tenth fairy tale, the next section of the book provides grammar notes for each chapter. These notes assist students in reading the fairy tale and advance their ability to understand the Latin language beyond what they read in the book's selections. Some of the grammatical structures presented include: comparison of adjectives and adverbs, deponent verbs, use of the hortatory, jussive, and potential subjunctives, the double dative, active and passive periphrastic constructions, various ablative constructions, indirect commands, opus est, and gerundive purpose constructions. These are explained briefly, sensibly, and with sufficient examples co help students to think about how these constructions have been used in the fairy tales and how they might be used in other works. Following the grammatical commentary is a short section with exercises to help students use the constructions they have just discussed. These exercises are presented as marching exercises, short fill-in-the-blanks, longer transformation exercises, and substitution exercises. At the end of the book, there is a more complete glossary, which includes words that were nor presented in the initial vocabulary lists that accompany each story. In this glossary, the student will find words they may have forgotten over the course of their study. All in all, there is a lot to offer a Latin class in this small book! Ten Fairy Tales in Latin is a resource especially for instructors teaching Latin to high school or college students, but also useful for self-study. It presents popular fairy tales translated into Latin, in a script rendition meant to be read aloud or performed. Each tale has a traditional ending and a "twisted ending", concluding the story in an unusual way. Each tale also has an accompanying puzzle or activity to help the solver further enhance their command of Latin. Grammar notes and exercises for a review of key grammatical concepts in each tale, vocabulary lists, and a complete glossary round out this excellent supplementary resource for Latin teachers and students everywhere. The ten fairy tales are "Goldilocks and the Three Bears", "Little Red Riding Hood", "Cinderella", "The Little Red Hen", "The Gingerbread Man", "The Three Billy Goats Gruff", "The Three Little Pigs", "Snow White and the Seven Dwarfs", "The Pied Piper", and "Sleeping Beauty".